Soccer, aka futbol, aka futebol, aka football, is also known as the beautiful game. It’s the closest thing there is to a universal sport, played in over 200 countries. It’s championship game, the World Cup final, player every four years, draws a television audience of over one billion, according to FIFA, the international governing body. FIFA (Fédération Internationale de Football Association) rules soccer internationally. And corruptly: its board is rife with bribery, which is apparently why it awarded the 2022 World Cup to Qatar, where summer temperatures reach over 120 degrees Fahrenheit. And it rules arbitrarily, inconsistently, and ugly, as when last week it disqualified the Iran women’s team for wearing head scarves to their match with Jordan. Why? Because head scarves were dangerous. Don’t you know, they’re a choking hazard. 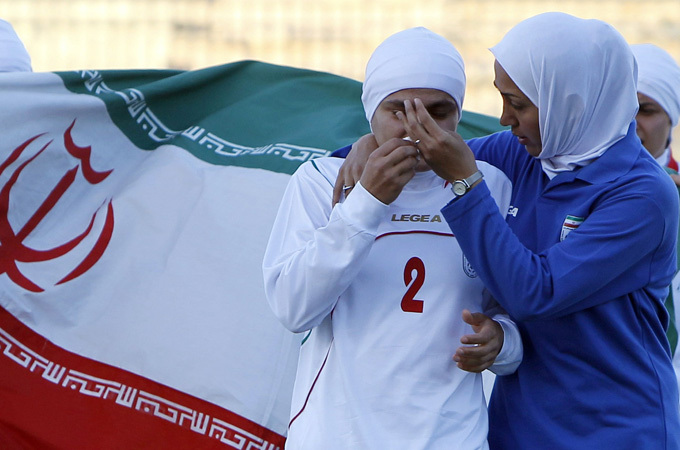 As a result Iran won’t have a chance to qualify for the 2012 Olympics in London.